What instruments are in a string quartet / trio / duo? How many musicians should I hire? Can you provide me with referrals from past clients? What time you do you arrive? What happens if one of you gets sick or has a schedule conflict? I'm interested in booking your quartet. Do you require a deposit? Would a tent be sufficient backup in case of rain? What about direct sunlight indoors through a window? Does the venue need to provide anything for you? What kind of music do you play for a reception, dinner, or cocktail hour? Can you play a special piece for me? Can you play Christmas music for a holiday party? My wedding is only 15 minutes long. Can I get a discount since it's shorter? I'm having a full mass Catholic wedding that will last longer than an hour. Do you charge extra for that? What will I need to select music for? What happens if my selected processional music is longer/shorter than the processional length? I'd like a trumpet to play along with the wedding processional / recessional. Is this possible? Can you accompany a vocalist or solo instrument? Do you charge extra for a rehearsal with the vocalist / solo instrument? How long is your prelude (while guests are being seated)? What if my wedding starts late? Do you expect to attend the reception? QUARTET: 2 violins, viola, and cello. The more instruments you have, the fuller the sound will be and the more music choices you will have. 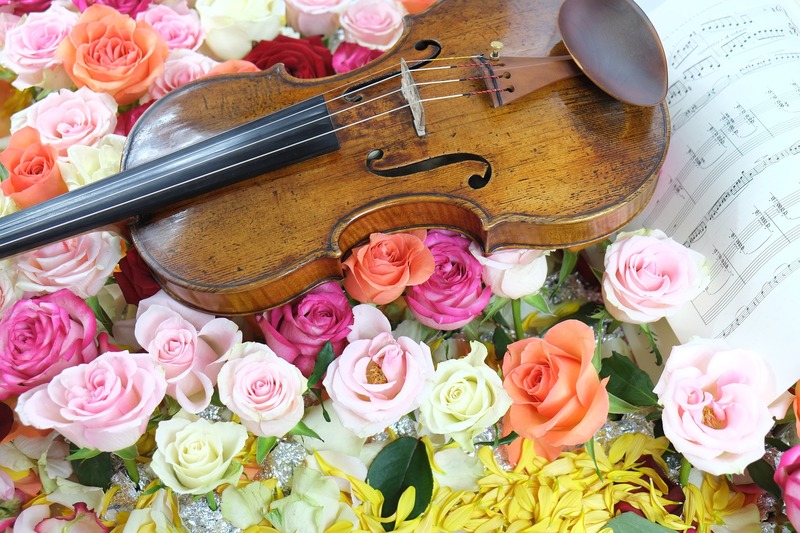 Whether you have 50 guests or 500, a string group can sound just as elegant in either case. An event can be small and intimate or grand and bold. The atmosphere projected depends on the event space, not the size of the ensemble. Anything you want: weddings, commitment ceremonies, a christening party, corporate dinners, holiday parties, and church concerts. We would be happy to provide you with referrals. You can also read reviews from past clients on our Wedding Wire page. Outdoors on cooler days or indoors (air-conditioned): Men wear tuxedos. Women wear all black. Warmer days that are either outdoors or indoors with no air-conditioning: Men wear business-type shirt, slacks, and tie. Women wear all black. For Weddings: We arrive one hour ahead in order to set up, warm up, and work out details with the wedding director. For other types of events: We arrive 30 minutes before our scheduled performance time. If one of our regular musicians is unavailable for an event, a comparable substitute will be contracted to play in his/her place. We know several professional musicians we can call on for this purpose. Since we are occasionally booked by agents, we have agreed not to post our rates on this site. You can fill out our Quote Request Form or send an e-mail to get rate information. Our manager does her best to send replies within 24 hours. We require a 50% deposit along with a signed contract. The contract can be sent to you electronically (PDF) for you to look over, and basically outlines date, time, location, special requests, and environmental conditions. If you cancel 30 days or more before the event, we keep your deposit but there are no additional fees. If you cancel within 30 days of the event, you are responsible for the entire balance. We have a few provisions outlined in our contract for outdoor playing, mostly for the protection of our instruments which are sensitive to changes in temperature (like direct sunlight) and humidity. Our instruments cannot be exposed to any amount of water (rain, drizzle, spray from a fountain). Note that tents are not always adequate protection in medium to heavy rain; many of them have tiny holes that let water through or rain blows in from the sides. We cannot be in direct sunlight. Sunlight can damage instruments (rapid warming can cause them to crack), cause them to go out of tune very quickly. If there is insufficient shade at the venue, the client will be expected to provide an adequate cover. If you are planning an outdoor wedding, please be sure to book an indoor location in the event of rain or extreme temperatures. The decision to move indoors can be made by your venue when they get ready to set up, based on conditions at that time. If the outdoor area is right next to a building, it may be possible for only the quartet to be relocated indoors with a PA system to project the sound outdoors. Unfortunately even "weatherproof" tents are not always enough protection against the elements. Some tents are moved around a lot and tend to develop tiny holes over time. They sometimes let in a mist of water which our instruments cannot tolerate. In a downpour, water soaks through eventually. Also, tents offer little or no protection in extreme temperatures. Tents can be pretty expensive to rent; you may find that a backup location inside a permanent structure is about the same amount. As with outdoors, sunlight can damage instruments (rapid warming can cause them to crack), cause them to go out of tune very quickly, and sunlight in our eyes prevents us from reading our music. The quartet should be placed out of the way of direct sun patches. The ideal space is approx. a 10 x 10 ft. square with level flooring. Space and shape can affect performance. We need to sit close together so we can see and hear one another easily. Chairs provided by the venue should be armless. If none are available, let the quartet manager know so we can bring our own. We need to be seated in armless chairs to accommodate bowing. We usually play a mix of classical and popular music. If you have a preference for one or the other, just let us know. Can you play a special request for me? Special song requests may incur additional charges for the arrangement. Please see the Special Requests page for details. Yes. We are always looking to expand our repertoire to accommodate clients, especially when it's music we could easily use again. Our current music library includes a some traditional Jewish wedding pieces and some Irish fiddle tunes. Absolutely. We have a complete collection of traditional Christmas tunes. Every wedding ceremony requires about the same amount of performance time and preparation, despite its length. The most typical ceremonies are 15 - 25 minutes long. However, that still translates to an hour of performance time - we include a prelude while guests are being seated and a postlude as guests exit after the ceremony. Processionals also add to the ceremony length. Also, we arrive about an hour before we start playing in order to work out logistics and cues with the ceremony coordinator and officiant. So in order to give you our best performance and services, we are on site 2 hours for every wedding ceremony we play. No. Every wedding ceremony requires about the same amount of performance time and preparation, despite its length. We are used to adjusting the length of the processional pieces as we play by watching everyone come down the aisle. We pencil in possible stopping points and repeats so we can easily adjust the length as closely to the processional as possible. Unfortunately it is impossible for us to attend Friday wedding rehearsals. Because we have day jobs that scatter us all over the city, we have found that we cannot leave early enough to attend. If your rehearsal is on a weekend, we can attend, but charge an additional fee for our time. Yes, as long as the piece selected is conducive to having a trumpet part added. Check out our Quartet and Trumpet page to hear samples of the different pieces we offer. We have worked with trumpet players before, have connections with some talented ones in the Atlanta area, and would be glad to book one for you. When inquiring about rates, please be sure to mention that you'd like a trumpet also so our manager can give you an accurate quote. Can you accompany a vocalist or instrumentalist? We need at least two months notice to plan accompaniment. This gives us time to obtain parts and communicate / rehearse with the soloist. If the accompaniment is not already in our library or cannot be obtained in quartet configuration, there may be an arrangement fee if a piano accompaniment has to be rewritten for the quartet. Please refer to the Special Requests page for details. For out of town soloists, we can create an MP3 audio file and send it a few weeks ahead so that he/she may practice with it. Once the soloist arrives in town, we will rehearse just before the ceremony. Do you charge extra for a rehearsal with the vocalist / instrumentalist? No. A rehearsal benefits us as much as the soloist. The only requirement is that they rehearse at our location or meet with us well before the event begins. 30 minutes is our standard prelude length. If the situation warrants a longer prelude, additional pieces will be performed at our discretion. A longer prelude may warrent additional fees, please refer to our performance contract for additional details. We understand that weddings start late for various reasons - late arriving guests, minor mishaps, and so on. We are willing to continue our prelude up to an additional 10 minutes, which is typically enough time to compensate for a late start. Please refer to our performance contract for specific details. Occasionally we book more than one event in a single day. Because of our obligation to other clients, we cannot stay longer than the time specified on your contract. If we have an event following yours, we will advise you and/or your wedding director of our obligations. No. We realize that most people are paying per person for their receptions, and we don't wish to add to their expense.